Interested in going by ship or ferry to St Petersburg? If so, learn more on your Baltic Cruise. Travelling by ferry to St Petersburg or on a cruise ship has become one of the most popular ways to get to Russia for many first time visitors. It is legal, relaxing and it can be a romantic idea for a weekend getaway, or even a good alternative to an expensive long distance flight. Photo of two major cruise ships and the St. Peter Line Ferry docked in St Petersburg. By sea you can experience a wonderful journey across the Baltic Sea and the Scandinavian coastlines, plus you can now take advantage of a new loophole that allows people to visit Russia without a visa. However, if you plan to come on a cruise ship or ferry remember that your visit will be short, unless you apply for a Russian tourist visa. Because by Russian law, passengers arriving by ship or ferries can stay no more than 72 hours on Russian soil without a visa, if they meet certain requirements (more on that later), while if they apply for a Russian tourist visa, they can stay up to 30 days. However, to enjoy the city to the fullest, and see all the top attractions you should stay at least five full days, less than that you will merely scratch the surface as there is way too much to see. Naturally between ferries and cruise liners you will find some differences when it comes to cost, comfort, service and freedom. Cruise ships tend to be more expensive than Ferries, because they are more comfortable and relaxing, plus they have certain restrictions that ferries don't have. Anyway both are easy ways to travel, and honestly speaking, whatever you choose will be nothing compared to what you will see. We, Anastasia and I (Davide), have travelled by ferry to St Petersburg on one occasion, but I still remember that time when I was chilling out on the deck and looking at the beautiful blue Gulf of Finland passing the coastlines of Russia. A really amazing experience! Saint Petersburg, sitting at the eastern end of the Baltic Sea, has been a major port city and an attractive destination for sea travellers since its foundation by Peter the Great. So getting to Russia's Imperial Capital by sea won't be difficult, but just a long pleasant trip. Map of the Baltic Sea Ferry Routes. Basically if you want to travel by sea you have two options: you can take one of the major international ship cruise lines (Princess, Norwegian, Royal Caribbean, Holland America, Carnival, Cunard Line, Celebrity, MSC, etc.) as some of our visitors did, or you can take the popular St. Peter Line, the only operator offering both a ferry cruise and a cargo ship directly to the city of St Petersburg. On the contrary, if you are looking for a further alternative that is not going direct to St. Petersburg, and time isn't an issue, then you could also take a ferry from Stockholm to Helsinki or from Stockholm to Tallinn with the Tallink Silja or the Viking Line (two established shipping companies well known and reliable). 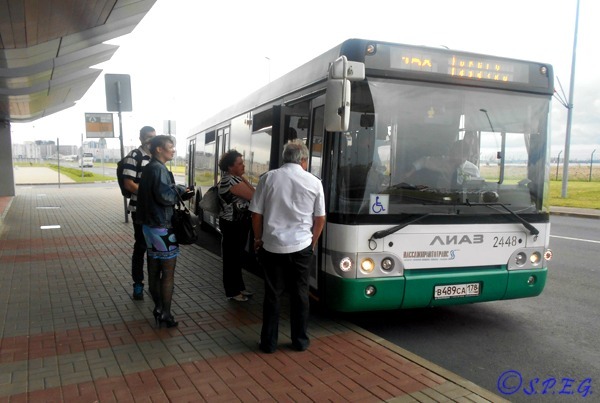 From there, you can continue your trip to St Petersburg by bus or by train. If you are on a tight budget then you could also try your luck with freight travel. We know that there is a direct ferry to St Petersburg from Luebeck (Germany) as well as to other Baltic cities operated by Finnlines, but we're not sure if they still board passengers, so check for yourself. The most popular routes for travellers taking a ferry from Northern Europe are Helsinki to St Petersburg, Stockholm to Helsinki and St Petersburg, or Tallinn to St Petersburg or Stockholm, and the other way around, while all the international ship cruise lines have a route to St. Petersburg, but they include several stops in some European capital cities, and even worldwide, if you board from USA, China or Australia. For your information, a sea trip by ferry or by ship is also different in terms of time travel. For example, if you travel by ferry to St Petersburg it may take from 15hrs to 40hrs, depending on the route chosen. If you're going with one of those major ship cruises instead, it will takes days, or even weeks, depending on your cruise package chosen. It will be a different type of trip, but in both ways you'll travel comfortably and avoid the official paperwork, though by ferry you'll have more freedom of choice. If you choose to travel on a cruise ship you can go ashore on the condition that you stay no longer than 72 hours, you are accompanied by an authorized tour guide, and stay overnight in the ship. This means that you cannot walk around the city freely. On the contrary, if you choose to go by ferry, you can go ashore on the condition that you stay no longer than 72 hours, you book an accommodation (Staying in Hotel is recommended for a short stay), and you buy a round trip ticket with the same company, including their "City Bus Tour", which is just a shuttle-bus ticket offered by the ferry company, but bear in mind that is not a real tour but only a round trip bus ticket from/to the city center. However, when taking a ferry to St Petersburg from Stockholm, Helsinki or Tallinn, as with St. Peter Line (the only operator offering these routes) you don't need to book a hotel if you leave on the same day as your arrival, but you must return in the same way as you came. That's the deal for your ferry to St Petersburg! Nowadays, most people prefer ship cruises to ferries because they let them travel cozily, hassle free, and see more cities. In fact, there is no doubt that going on a cruise ship is totally a different and better travel experience than going on a ferry cruise. On board a cruise ship - Photo taken by usi.web.tr - Source unknown. 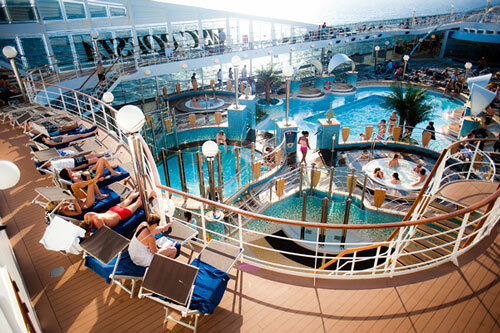 On a ship cruise you can make friends on board, relax with all the services provided (sauna, massage, gym, swimming pool, jacuzzi, etc), sleep comfortably, eat delicious food a' la carte, and enjoy the on-board entertainment (shows, night clubs, bars, casino, etc). Basically, you can travel in comfort, relax and have fun. On the contrary, when going on a ferry you will save money, but you won't experience such a luxurious trip as with a cruise ship, even if this St. Peter Line appears to be no less. Normally, the price varies according to the cabin category and cruise package chosen, the season you are travelling, and the time or date you are planning to leave. So start doing your research in advance. The sooner, the better! The same thing applies when booking a private tour! In conclusion, when it comes time to book a shore tour you have two options: you can take the tour offered by your ship company, or you can find one on your own before you go. Definitely, the second option will guarantee you a much better experience and it is legal in terms of visa. So, if you plan to travel by ship or a ferry to St Petersburg, this is up to you, but if you go, then make sure you avoid booking their package shore tours, they are usually boring, low quality, and overpriced for what you get. By now you should know that whether you go by ship or ferry, an official tour is needed, so personally speaking I think you should be booking a good comprehensive one - a tour that will help you get the most out of your short visit. Take a ferry to St Petersburg with St. Peter Line and enjoy a regular sailing from Stockholm, Helsinki or Tallinn, and stay in Russia for up to two nights before sailing back. All you need is your passport! The St. Peter Line is a famous Russian based ferry operator that offers moderate high-class Baltic cruises on Princess Maria and Princess Anastasia ferries, as well as on a regular cargo ship. St. Peter Line - Ferry Princess Maria - Photo by Kalle Id, Wikimedia Commons. Cargo ship won't be of interest I think, so let's look in more details at the two most popular cruise ferries, Princess Maria and her sister Anastasia, the only options currently available that will bring you directly to St Petersburg Russia Visa free, if you decide to go with them of course. As far as we know, these ferries were named after daughters of the last Russian tsar, who were murdered by the Bolshevik secret police after the Red Revolution. They both offer a high level of service and entertainment on board similar to those big cruise liners. In fact, cabins are basic by cruise standards but lavish compared to a ferry. Lucky for you the prices are more like ferries too. To give you an indication, a one-way trip starts at €38/$42 in a shared cabin below the car deck, while a two-berth cabin on an upper deck starts at €165/$181. Alternatively, a B-class private cabin for yourself, both ways, costs around €356/$390 (including the mandatory city tour). Certainly you could economize your journey by buying a special offer package, sharing a cabin with someone else, or booking a few months early. St. Peter Line - Ferry Princess Anastasia - Photo by Pjotr Mahhonin, Wikimedia Commons. As I said earlier, on board you can expect a few cruise-ship features, such as an entertainment lounge, casino, tax-free shop, cinema, sauna and even a small swimming pool deep in the bowels of the ship. Not too bad for being a mix of a ferry and cruise, is it? But there is more! hotel or excursions packages, and you can even bring your pet on board, at a price obviously. But the best part, the one I suppose why you might choose to go with them, is that if you buy their city shuttle-bus ticket at the same time as you book your ferry trip, you qualify for the 72 hours Visa free rule. This city tour deal is actually no more than a shuttle bus that would take you to the city from the port and back to the port on your departure day. As soon as they drop you off in the city - you're free to go anywhere, free to use public transportation, visit museums, theaters, restaurants, shops,etc. That said, the difference between the two ships is their sea route. If you go with Princess Maria, you will cruise directly from Helsinki to St Petersburg or reverse (average time 15 hrs), while if you go with Princess Anastasia, you will cruise from Stockholm to St Petersburg or from Tallinn to St Petersburg, and reverse (average time 40 hrs). To purchase your ferry or ship ticket (whatever you like) you have two options: ask a travel agency or book online. Personally speaking, among the two, the cheapest and easiest way would be to book on the internet. The best thing to do would be to find the website for the shipping company of your choice, and then see if they provide a ticket reservation service online. Alternatively, you can find a travel agency that represents the shipping company you have chosen and ask them to arrange the tickets for you. Nowadays there are many Baltic tours available and so many travel agencies you can contact. However, by buying online, you will avoid the inflated prices of some tour operators or the travel agent service fees, and you won't need to call or travel to the agency. So, online is really the way to go as you will get a better deal while booking comfortably from your home. 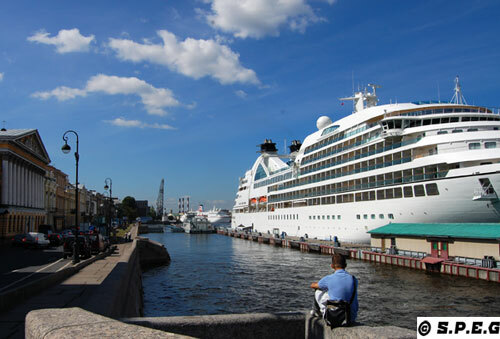 The city of St Petersburg has two passenger terminals: one for sea passengers and one for river passengers. So, if you will be travelling by ferry to St Petersburg via sea, you will dock at the new Sea Passenger Port (Marine Facade), while if you will be travelling by ship via river, then you will dock at the old River Passengers Port (Rechnoy Vokzal). 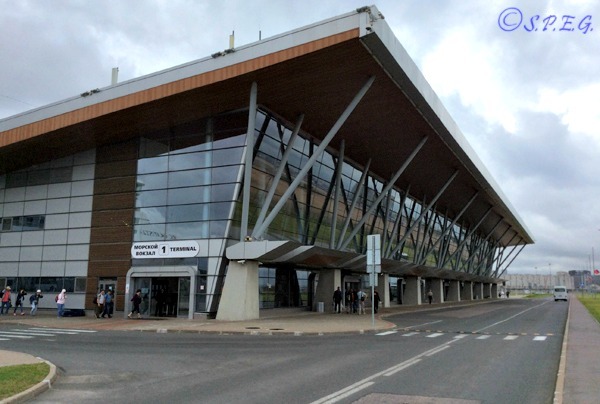 Specifically, the new terminal of Marine Façade will be the place where you will arrive when taking a ferry to St Petersburg with St. Peter Line or other major ship cruise lines such as MSC, Norwegian Star, Queen Elizabeth and many others. The sea port terminal Marine Facade in St Petersburg, Russia. Built in 2011 and located in the Harbor of Vasilevsky Island the sea terminal Marine Facade comprises a modern building, with a total area of 18,500 square meters and landing-stages capable of taking four ships at once. Inside you will find comfortable and spacious arrival halls, ATM machines with a currency exchange function, cafes, a souvenir shop, post office, duty-free shop, information desk, VIP waiting area where you can relax, and much more. Today, it handles more than 200,000 passengers each year and provides ferry connections with the cities of Tallinn, Helsinki and Stockholm and also sea trips, excursions and cruises. On the contrary, the old River Passenger Terminal Rechnoy Vokzal, welcomes all Russian river cruises from Moscow, the Northern part of Russia, and cruises on river - going vessels along the Neva as well to the islands of Valaam and Kizhi (the most beautiful Russian islands located in the Ladoga lake). Basically this will be the place where you will arrive if you take a river cruise on the Volga River or across the large Neva. If you're planning to take a ferry to St Petersburg, and you hold all the necessary documents to go ashore then keep reading the information below, while, if you are a cruise passenger skip this paragraph, as you cannot leave the ship on your own. The bus n.158 linking the sea port terminal to St Petersburg downtown. With that in mind, from the sea passenger port to the city you can take the bus № 158 or the minibus (marshrutka) which goes to metro station Primorskaya, two stops from the Nevsky Prospekt station in the city center. The price should be around 1000rubles (€18/$20) or less for a taxi, while 36rubles (€0.65/$071) for the Marshrutka. The trip takes no more than 20 minutes. Instead, from the River Terminal to the city you can easily walk to the nearest metro station Proletarskaya - it takes about 10 minutes - and from there, take the metro, taxi, or bus to reach the central part of the city. If your plan is to stay only two or three days in the Northern Capital of Russia, then we don't see the point of going through the visa process, but rather we believe you should book a ferry to St Petersburg with the St. Peter Line, or one of the big ship cruise lines. This way you'll take advantage of the visa free service offered. Your boat boarding pass serves as your visa during your stay in St Petersburg. You will NOT get a visa in your passport, you simply carry around the boarding pass with you at all times, along with your passport and your travel insurance. When you take a ferry to St Petersburg with St. Peter Line bear in mind that if you arrive from outside the Schengen area, you must have a multiple entry Schengen Visa to enter back to Finland after the cruise. See here for more info! Passengers arriving under the VISA FREE regime must stay within the territory defined by the pre-paid excursion program. After docking in St Petersburg you will see a huge line to get off the ship as well as another to board, as all passengers have to go through passport control. So we would suggest getting in line very early to avoid the long queue. At passport control, you will have to show your mandatory tour pass (the visa-free pass bought with the ticket ferry or ship, or even the ones you bought on your own before coming), and a valid passport (valid 6 months beyond intended stay). You'll need also to show your hotel confirmation and the mandatory shuttle-bus ticket, if you take a ferry to St Petersburg. In the event you rent a flat (I don't recommend it) then an invitation letter is requested. When outside the terminal you will see several white little mini buses with a St Peters Line sign in the windshield. Get on one of those if you have booked a tour with them and they'll drop you off (for free) at any sites around the city or at your hotel. Alternatively, if you have booked a private tour with another operator, for example with us☺, your pick up and drop off transfer service will be arranged along with the guide and tour vouchers, all included in the package tour. The ship or ferry to St Petersburg without a Russian visa is a good deal if you don't want to hassle with getting a visa. But - soon you will realize that 72 hours is not enough to see all there is to do and see in St. Petersburg. Remember, the visa-free program is basically set up so that ferry or cruise passengers book tours and/or accommodation with them. But you know now that you have a choice. Learn more about St Petersburg shore excursions here, or get in touch with us if you need help or still have some questions about how to go by ferry to St Petersburg. From Ferry to St Petersburg return to Travel to St Petersburg, or go back to the Homepage.